In its 28 day lunar cycle, the moon passes through 12 unequal sectors derived from the stellar constellations, (referenced by zodiac signs). The passage of the moon in front of each Constellation is based on Astronomical data and therefore differs from the traditional astrological division of equal 30 degree sections. Each constellation is associated with one of 4 categories, representing the 4 Elements (Air, Water, Fire and Earth) and each Element enhances one particular aspect of each plant (see below). We use different parts of plants for different purposes, so it is important to understand which part (or aspect) of a plant we need to nurture, and the moons’ effect on each aspect. 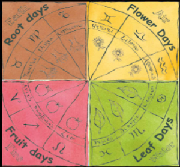 Lunar Gardening classify these parts as either root, flower, leaf, or fruit. For example we grow Tomato plants for their fruits (rather their leaves, roots or flowers). NB: Most vegetables that grow above ground are in fact fruit (Eg: tomatoes, cucumber, courgettes, beans and peas, pumpkin, peppers) as well as fruits like strawberries, apples, pears, plums, cherries ….